Mardi Gras time in Portland! I’m working with a great team of New Orleans ex-pats who’ve transformed themselves into the Mysti Krewe of Nimbus . In New Orleans, a krewe is mearly an organization that puts together a float, parade or celebration ball for the Mardi Gras season. There are a gazillion Krewes, some very old and revered, some new and piecemeal! 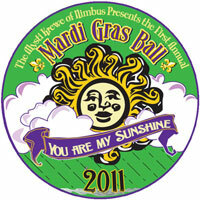 Continuing the tradition from thousands of miles away, The Mysti Krewe of Nimbus is hosting Portland’s First Annual Mardi Gras Ball Saturday, March 5th, 2011 at the Norse Hall on SE 11th. Tickets are $25. Dance lessons! NOLA style food! King and Queen! masks, a parade, and the crowning of a Mardi Gras King and Queen will round out the festivities. Come on out and let the Bon Temps Roulez! See my earlier post about the Live Gamera vs. Guiron Filmusik performance at the Hollywood theater. You like it hot? You like it Sichuan ? This is the place for you! On a daring visit about a week ago, we had to try the latest and greatest in Asian food. Friends had recommended it, so why not? My brother from Florida, my world-globetrotting mom, and my up-for-anything S.O. journeyed out to far SE Powell for culinary daring-doo. This is NOT General Pao’s chicken in cornstarch sauce. This is apparently straight-up vocanic Sichuan cooking. Our table of 4 ordered the Seafood pancake, green beans, plain rice, beef with broccolli , and the plain asian vegetables. The seafood pancake was delightful. Chock full of briny squid, shrimp and other flavors, and served with a spicy (but not overwhelming ) peppers in oil dipping sauce. The green beans were smothered in easily avoided red chile peppers. They had a delightful salty clean flavor, balanced with a mouth numbing peppercorn. (I later found in this yelp review, it’s called “huajiao”). The Beef and Brocolli was listed as “on the safe side” on the menu. Being vegetarian, I tried the broccolli only. Nice, garlicky and bland! If I had do-overs, I’d take my mother and brother to a ‘safer’ Asian joint, like Om Seafood or Powell Seafood, both also on SE Powell. This is not so great for non-meat eaters, but glad I tried it! Live soundtrack, live voice, all cheese! Check out the trailer. Whet your whistle with The Room! And for Halloween – back to the Hollywood Theater for Phantom of the Opera! Handmade NW :: Events Check out what we’re doing and you’re invited to join! 🙂. Deep in the junk drawer..